With proximity to public space and residential units, this typical highway structure has 3 distinct conditions needing to be considered. 1: View down from the buildings: People from the residential tower are disturbed by not only noise but also lights from the highway. the climber plants on the barrier hide the barrier and highway. It also block off substantial portion of the vehicles lights and highway lights. 2: View up from the park: People from the park would see the concrete underside of the highway. 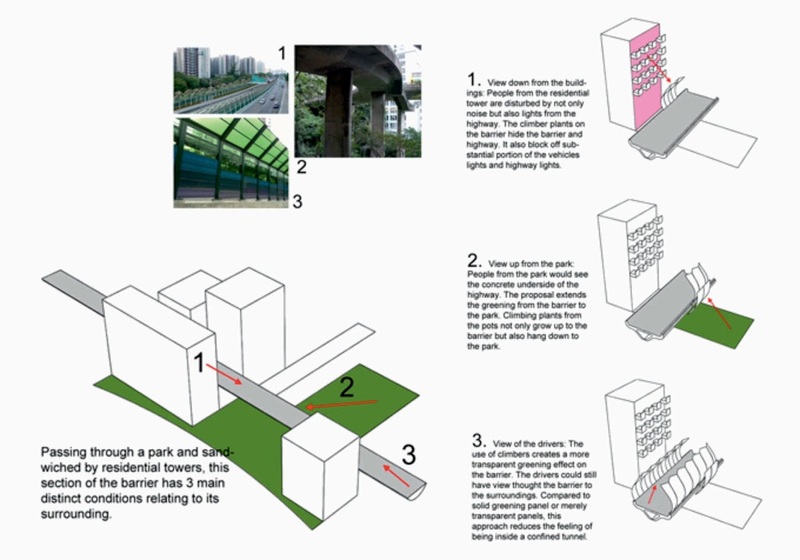 the proposal extends the greening from the barrier to the park. Climbing plants from the pots not only grow up to the barrier but also hang down to the park. 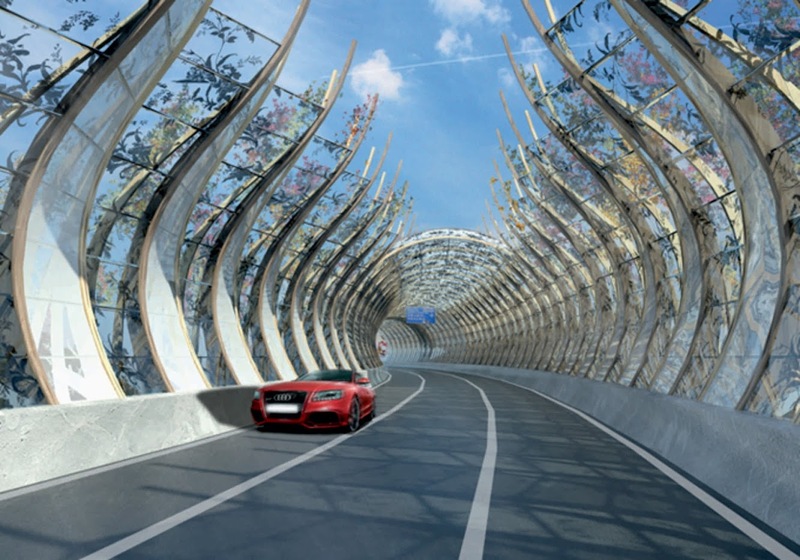 3: View of the drivers: the use of climbers creates a more transparent greening effect on the barrier. the drivers could still have view thought the barrier to the surroundings. Compared to solid greening panel or merely transparent panels, this approach reduces the feeling of being inside a confined tunnel. 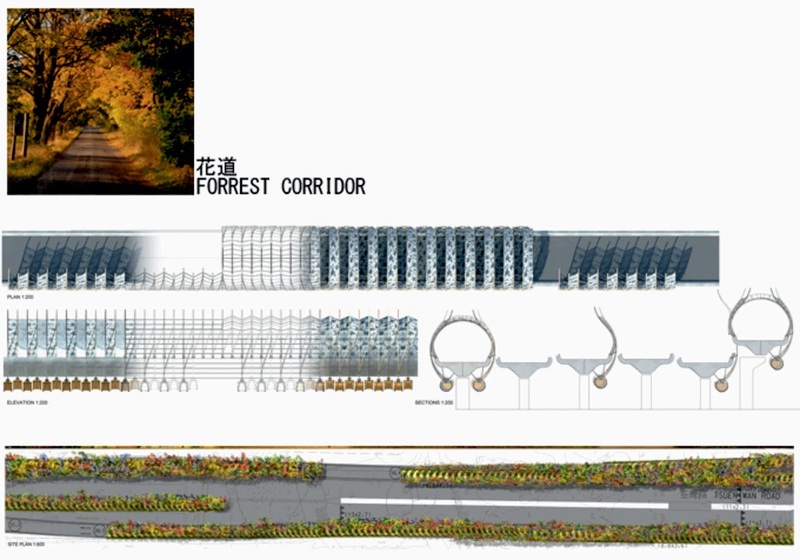 Efficient and better greening Vertical vegetation panels have been proved to be not desirable for greening highway condition. the shallow soil depth makes the plants dry up easily. the complicated irrigation system which it requires also makes the maintenance demanding. 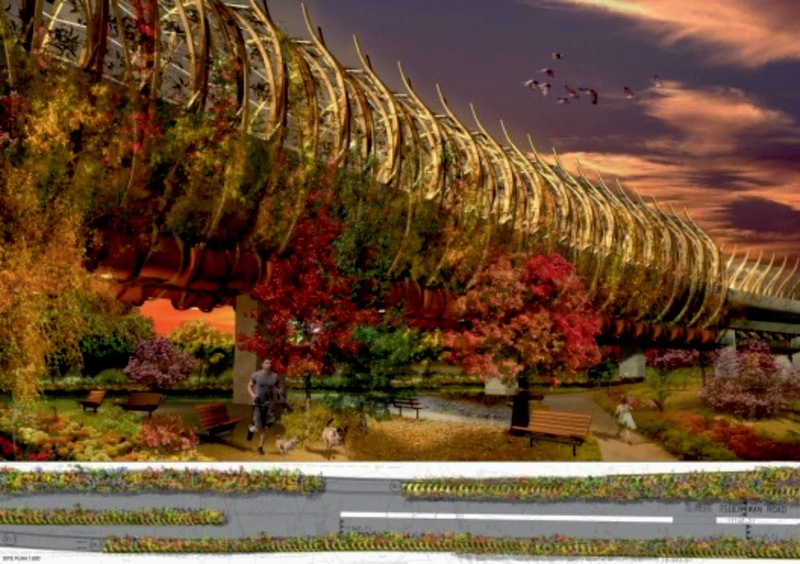 the proposal has planting pots underneath the highway. These pots provide proper soil depth for heavy and low maintenance plantings. Renewable energy supply the pendulum system generates electricity from surrounding wind and turbulence from the passing traffic. Compared to the use of Pv panels which requires particular installation angles and imposes visual disturbance, this system works holistically with the entire design and more independent to weather conditions. the surplus electricity could supply lightings for the park facilities and podium of adjacent residential block. Ecofriendly materials and operations Main posts are made by laminated recycled plastic lumber. This material is made of recycled milk jugs and shampoo bottles which contain the required high- density polyethylene. It is made by recycled high weight and durable. This ecofriendly material has been tested in building 50 feet spanning bridge with loading capability of 15 tons and life expectancy of 50 years. Rainwater is collected from the barrier and road surface are channeled down to planting pots with petrol filter. the use of deep planting pots allows large reserves of water in soil. This eliminates the requirement of irrigation system. 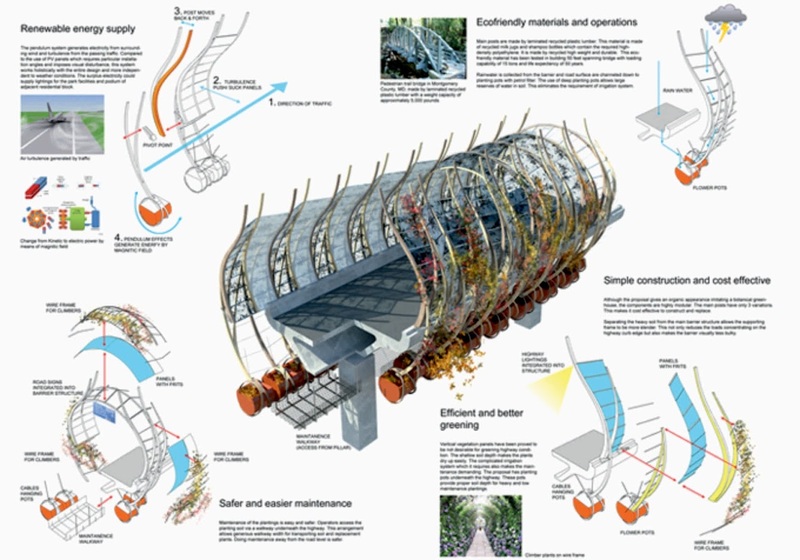 Simple construction and cost effective Although the proposal gives an organic appearance imitating a botanical greenhouse, the components are highly modular. the main posts have only 3 variations. This makes it cost effective to construct and replace. Separating the heavy soil from the main barrier structure allows the supporting frame to be more slender. This not only reduces the loads concentrating on the highway curb edge but also makes the barrier visually less bulky. Safer and easier maintenance Maintenance of the plantings is easy and safer. 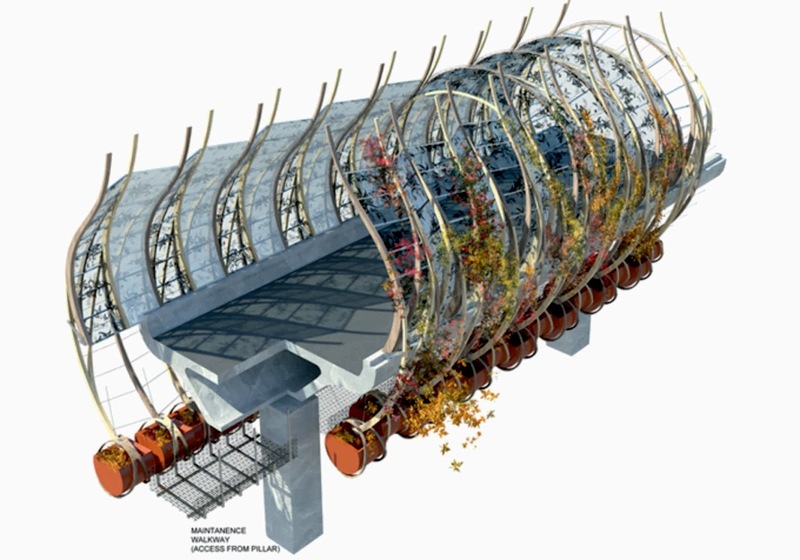 Operators access the planting soil via a walkway underneath the highway. 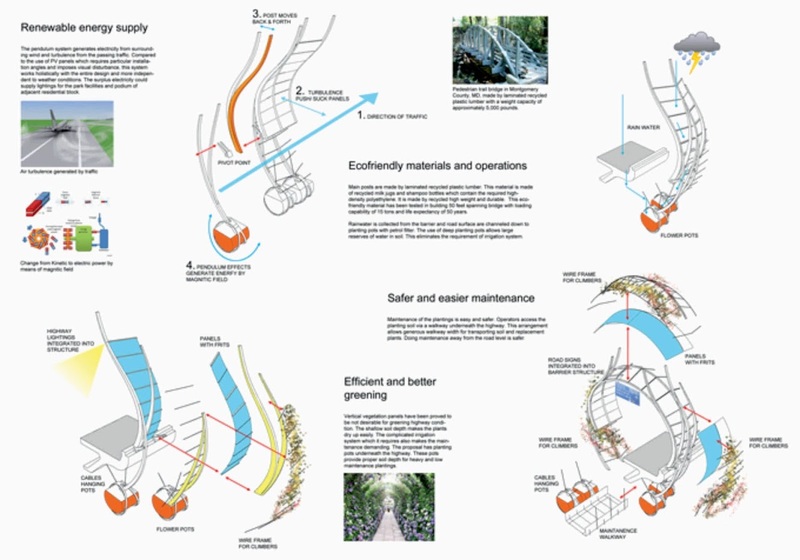 This arrangement allows generous walkway width for transporting soil and replacement plants. Doing maintenance away from the road level is safer.